The festival ‘'Young wine parade'' is a trademark, registrated by the Tourism Council of Plovdiv, for organizing and conducting of tastings of young Bulgarian wines in the last week of November in the Old Town of Plovdiv. 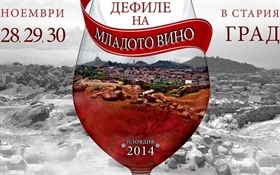 The Tourism Council - Plovdiv and Municipality of Plovdiv organized the ‘'Young wine parade'' in active cooperation with the National Vine and Wine Chamber, Municipal Institute ‘'Ancient Plovdiv'', the Association of Bulgarian winemakers, the European Knight Order of wine, Municipal Enterprise Tourism - Plovdiv, SOL Communications Ltd, Foundation ‘'Plovdiv 2019'', all the participants in the wine business, as well as institutions related to art and culture in the city. During the festival wine producers present in the unique atmosphere of the old houses their new wines. Tastings are accompanied by cultural events, lectures, devoted to wine, date information on wine producers and more. All that, combined with the compact inclusion of dozens of locations and massive communication becomes an important focus of Plovdiv. The event ends with the "Night of Masters of Wine," during which the professional jury and the audience award the best young wines. New wine tastings are part of wine culture and an opportunity for manufacturers to advertise and sell their products. The locations where wine is tasted are houses and open spaces in the Old Town. Winemakers are located both inside the houses and in the yard tents with heaters provided. Each winery organizes its presentation, branding, etc. Manufacturers of sausages, cheese, bread and mineral water, actively use the event to promote their products. Restaurateurs offer their products in special pavilions Lapidarium in the Old Town.